Good news! But, the Macon Library needs just a little more support. Please send an email to the commissioners to ensure that the library receives long-term funding. Good News, But The Macon Library Needs Just a Little More Support! We are extremely excited to announce that the Macon-Bibb County Commission heard your voices and unanimously voted on Thursday (08/16/18) to pass emergency funding to avoid library closures for the next month. They also voted to pass a millage that could potentially fund the library. Even though the commissioners voted to pass a millage that could keep the libraries open indefinitely, the vote didn’t specifically designate long-term funding to the library. In fact, Commissioner Mallory Jones says that he didn’t vote for the millage because there was no designation of funds attached to it. “This is an emergency measure to keep libraries, and we're hopeful that's it's continued,” said Library Director, Jennifer Lautzenheiser. We want to make sure that this funding is continued and that a percentage of the the money from the mill will be designated for long-term funding for the Macon libraries. The Macon-Bibb County Commissioner must reverse their cuts now! CLICK TO SHARE THIS PETITION ON FACEBOOK AND TWITTER! Macon-Bibb County Commissioners have voted to close the Middle Georgia Regional Library because they could not agree on a budget. The Middle Georgia Regional Library is absolutely vital to our communities. Already the Riverside branch, the Sturling branch, and the Lanford branches are going to close on Tuesday, July 3rd. The Washington branch will only be open as long as reserve funding holds out. And all that the Macon-Bibb County Commissioners need to do to fix these cuts is vote to fund the library. We need your help to get them to do it right away. 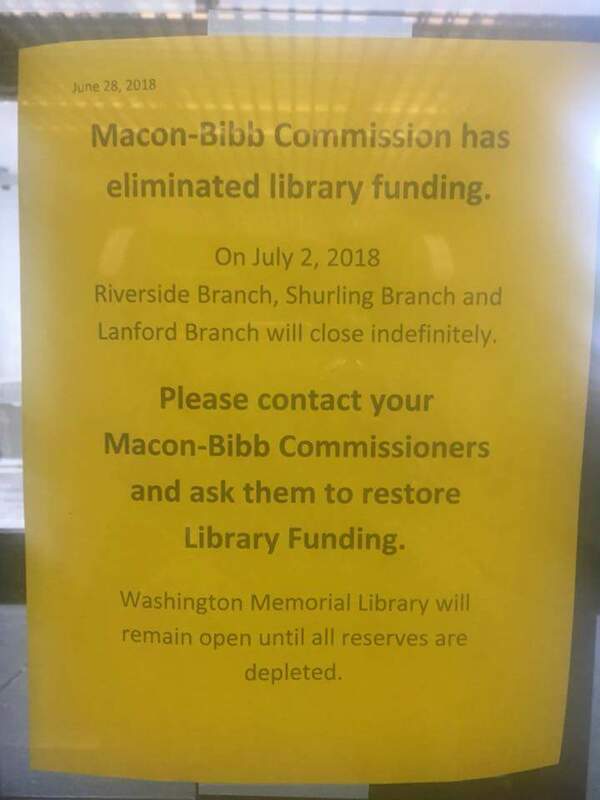 Please act now to send a message to the Macon-Bibb County Commissioners that our Middle Georgia Regional Library must remain open and must be funded. Your voice matters. Things are moving fast, so every minute counts. Three out of 4 libraries are ABOUT TO CLOSE ALREADY. Can you please take a moment and help save the libraries across Macon and Bibb County? Every contact from Macon-Bibb County residents will help. Please share this page on Facebook and Twitter!. Please help turn around these cuts and keep our Middle Georgia Regional Library open!